Browsing Category "Instructions for SSB interview"
Girls today i am uploading a SSB story of Kavita who has been successfully recommended this Interview will give you a better idea for Interview. Have faith and confidence in you, You can do it!! I.O. : Ok, Kavita how are you, how is the city. How was the food? Ch. No. 6: I am fine sir, Bangalore is very nice city and food was also nice. I.O. : how was your Psychology Test? Ch. No. 6: It was very good sir. I completed all pictures and all words I did 58 SRT and I completed self-description. I.O. : In which part of psychology you did well? Ch. No. 6: Sir, my WAT was very good. I.O. : Which word you admire and you write the best sentence? I.O. : What sentence you made? Ch. No. 6: Major Manoj Pandey sacrificed his life in Kargil War. I.O. : now, I am going to ask the question from your PIQ. Tell me about your education from 10th standard to till now. Tell me about your favorite subject and why. Tell me about the teacher you like and about the teacher you don’t like, tell me about the qualities of your favorite teacher and what are qualities you don’t like in the teacher whom you don’t like. Ch. No. 6: I told all about my education from 10th to M.Sc with the reference of college, subject and marks. Subject which I like, is mathematics because I feel comfortable and I have interest in maths and my basic concept are clear in it so I rarely face any problem to understand it. The subject which I don’t like is Organic chemistry. I have less interest in this subject because I feel tough to understand the organic reactions which are important in this subject, and you can also see my number in this subject. I.O. : What kind of problem you face to understand the reaction? Ch. No. 6: Sir, particularly the mechanism of every reaction make me confused and some time we need to cram it that is also a problem with chemistry, through other branch [Inorganic and Physical] I like. I.O. : Now tell me about teacher? Ch. No. 6: Teacher which I like his name is MR. R.K. Sharma; he was my maths teacher in my graduation. I like him because of his regularity and his great dedication towards his profession. I.O. : How will you define that he was dedicated? Ch. No. 6: Sir, he was very punctual and he used to take classes regularly. He also taught other things like the qualities and responsibilities of a good student. I have learnt from him. About the teacher which I don’t like but remember in graduation my Organic Chemistry teacher Mr. P.K. Srivastava I used to feel problem in his period. Main reason was my less interest towards the subject and he used to ask the questions in class. But I would like to add that only because of that class practice I could clear my B.Sc with Chemistry in good marks. I.O. : Ok, Kavita now tell me about your hobbies, interest and the game you play, your activities in extracurricular programs and also tell the motivating factor to join Army, for you? Ch. No. 6: Sir, I like to read poems, quotations, books and newspaper. I have interest in doing yogic exercise. Nowadays I am not a regular player of games but during my school I have taken part in 100 m race and 400 m relay race. I was also in the team of Kho-Kho. I.O. : Now tell me about your friends with their full reference. Tell me about your family. Your relations with your mother tell me what is your family occupation and motivating factor for you to join Army. Ch. No. 6: Sir, I have a big friends circle. Some of us are in same field but some have chosen the different way as their career. Like two of my friends Deepika Sharma and Nitin are doing M.C.A. from Delhi. One of my friend Priya Darshanee is in O.T.A and one of my friends is in N.D.A. I.O. : Kavita tell me two qualities of your friend Deepika Sharma and also about two qualities which she sees in you. Ch. No. 6: Sir, she is very hard working and dedicated girl and the qualities which she seems in me, she treats me as a binding factor of my friends circle because of my cooperative nature. She also admires my sense of responsibility. About my family I have three members in my family, my mother, my elder brother an myself. Regarding my father I have lost my father in a very early age that was an accident. About my relation with my mother, these are very good. I really admire her company as a mother or some time as a friend also. Though she is the only person to look after the family, yet she has to play a role of mother as well as a father also. She makes me disciplined but she also provides such a light environment that I share all my personal with my mother. I still remember how she used to teach me basics. I really like her way to first realize my mistake then her way to make me correct. I.O. : Tell me about your brother? Your relations with him? Ch. No. 6: Sir, my brother is two years elder than me. He is doing his M.C.A. from Meerut. He is very cooperative and always helps me in my need like in my study. We enjoy each other company we discuss our matters to each other. We study together some times we enjoy spicy relation when we quarrel. One thing I really admire in him that he is very loving and caring. I.O. : Kavita what you do to keep yourself fit physically and mentally. Ch. No. 6: Sir, to keep myself physically and mentally fit I go for morning walk, I do yoga and meditation. I.O. : How you do meditate what is the effect of it? Ch. No. 6: For meditation first I select the good time and open place. Generally, I do early in the morning around 4 o’clock. I keep my mind free to absorb the inputs. I am in learning process, I am increasing my capacity to listen soundness in my surroundings. With this exercise concentration becomes strong ad mainly it is the exercise of mind and it gives good effect on mind and body co-ordination. I.O. : Kavita tell about your village, what is the difference between Sardhana and Bangalore? Ch. No. 6: Sir, my village Kakkaypur is small village which is situated at Meerut Kernal State Highway no. 82. It is 21 km far from district Meerut. Population of my village is around 5000, main crops are sugar cane and wheat. Basic occupation in my village is farming. Regarding the infrastructure of my village is concerned there are a primary health centre and a junior high school. For further study we have to go either to the town Sardhana which is just 5 km far from my village or to the district Meerut. Nearest market of my village is Sardhana. It is a famous place because of St. Mary’s Church. It is the top most Church of Asia. I.O. : Who built this Church? Ch. No. 6: sir, Begum Samru. I.O. : When it was made and tell me the name of Begum Samru’s Husband? Ch. No. 6: Sir, it was made in 1822, and sorry Sir, I don’t know her husband’s name. I.O. : Ok. Any member in your family belongs to Army? Ch. No. 6: No sir. I.O. : So why do you want to join Army? Ch. No. 6: Sir, mainly to join Army, I am motivated with Kargil war that time I was in 9th standard. I have seen the live telecast on T.V. I also read in newspaper about the tough efforts of our Army and about their achievements. And sir, I am from the area Meerut which has 2nd largest Army cantonment. I have seen the discipline of army soldiers, dress and its passion really attracted me. I.O. : Kavita, in problem where do you go? Ch. No. 6: Sir, in problem, I discuss it with my mother because she always motivates me to face the problems and to overcome from them. She always says me to step forward. I.O. : What last problem you discussed with your mother? Ch. No. 6: As my exam of M.Sc. is not completed and the date is also not fixed, so because of this I was quite worried so my mother make me relax and advice me to concentrate over my interview. I.O. : Ok, Kavita if I ask you about your two qualities so what will you say. Ch. No. 6: Sir, I am very co-operative and courageous. I.O. : How can you say that you are courageous? Ch. No. 6: Sir, whatever the situation come in front of me. I face them boldly and I think being a civilian I have chosen Army as a career. It is itself a strong decision. I.O. : If you are not selected then what would you do? Ch. No. 6: Sir, I will make it this time because I am very sure but if not, then I will try again. I.O. : Ok, tells me about your two reasons of disqualification? Ch. No. 6: My hand writing is not good and communication in English is not up to the mark. I think I and lacking in these two. I.O. : Ok, Kavita wish you all the best? Ch. No. 6: I said thanks, and wished him. Kavita is a promising candidate, fully prepared to take the interview. Her general awareness is exemplary and understanding the situation’s is praiseworthy. Recommended to be selected in Armed forces. Dressing Tips for SSB: The Importance of Good Dressing to create a better Impact. Guys if you are thinking of Personal INterview in SSB, what types of Questions asked in SSB Interview and how should we answers in Persnal interview round in SSB, then go threw this post this will help you alot. Ch. No. 18: Good Morning Sir. I.O. : Please have a seat No. 18. Ch. No. 18: Thank you sir. I.O. : So, Prateek you are from Meerut, tell me about Meerut. Ch. No. 18: Sir, Meerut is a district, located at 60 km distance from Delhi. Sir, historically Meerut is known as the Sasural of Ravana. Sir, it was also the initiator of revolt of 1857. It is also rich in tradition. I.O. : (interrupting) Ok Prateek now tell me about your education from class 8th? Tell me about your co-curricular activities and the games which you play? Ch. No. 18: Sir, I studied my 8th, 9th and 10th class from the same school, i.e. K.V. Sikh Lines, Meerut. Sir, I scored 90.8 percent in my matriculate with distinction in all the five subjects. I.O. : (interrupting) Prateek tell me your class 8th and 9th percentages also? Ch. No. 18: Sir, I scored 88 percent in my 8th class and 89 percent in my 9th class. I.O. : Ok Prateek, carry on. Ch. No. 18: Sir, I was an active participant in co-curricular activities in my school. I participated in Kabir Peace Mission in 8th class and stood first in my school. I.O. : (interrupting) What is this Kabir Peace Mission Prateek? Ch. No. 18: Sir, it is a quiz competition in which the questions are asked mainly on history, Ramayana and Mahabharata. I.O. : Ok, carry on Prateek, that’s why I think you know about Ravan’s Sasural? Ch. No. 18: Yes sir, besides this, I participated in Green Olympiad in 9tha and 8th class and stood second in school. Sir in this science quiz takes place. Sir I also participated in youth parliament in my 10th class in which school students make their own parliament. Besides that I also participated in debate and extempore in my 8th and 9th and 10th class consecutively and every time held and position. Sir I also participated in cricket team in my 9tha and 10th class at school level. I.O. : Prateek, you didn’t play even at regional level? Ch. No. 18: sorry sir, I put in my efforts buy still there were better players than me. Sir, after my 10th class, I switched over to Guru Tegh Bahadur Public School because there is scholar section in it which provides coaching in school time only for IIT and while studying for IIT we got to know the concepts more clearly, as I always wanted to have command over the concepts., sir there is participated in National Science Olympiad and also participated in volleyball team at school level. I.O. : Ok! That’s really nice Prateek, Ok now let’s move out to your family and teachers? Prateek tell me about your parents and teachers you like most and least? Friend you like most and least? Ch. No. 18: Sir, as far as my parents are considered, I really love them and they also take care me really well. Sir my father is an ex-service man; he is a real motivating force for me to join IAF. He is a very caring person. Sir, my mother is a housewife. She is really very emotional person that’s why I am also very emotional person. Sir about my favorite teacher, its Mrs. Summi Singh, she was my motivating force to join IAF; she really takes care of my all class. And Sir there is no teacher I hake, as I like every person. About my friends, I have a big friends circle. My best friend is Sudhanshu. I.O. : Prateek tell me about the qualities which you find in friends and what are the qualities in yourself which attracted them towards you? Ch. No. 18: Sir, Sudhanshu is a very good person. He always helps me. Sudhanshu has very similar likings to that of mine so we understand each other really very well. And sir about me, I think I am a friend who is always there of my friends whenever they need help. I.O. : Ok, Prateek do you have any girlfriend? Ch. No. 18: No sir, I don’t have any girlfriend? I.O. : Why? You are studying in a co-education school still you are not having any girlfriend. Why? Ch. No. 18: Sir, my first target is to achieve my aim to get into Air Force. After that I will consider these things. Moreover, girlfriends need very large amount of money to be spend over them and I am not spend thrift. I.O. : That’s true Prateek; they really need a huge amount of money. Ok, tell me about your more friends? What do you in your leisure time with your friends? Ch. No. 18: Sir besides Subhanshu, there are Prashant, and Arvind, we have discussions on various topics. In leisure time we also go to watch movies also, but we watch only social issue based movies? Sir. I.O. : Ok, Prateek these two girls Indra and Pooja never attracted you towards them? Ch. No. 18: No sir, we are just friends and nothing more, and no one of us has this type of feeling on our minds. I.O. : Ok, Prateek now tell me about your one good and one bad quality? Ch. No. 18: Sir, in my good qualities, I really very soon understand the expectation of others which they have from me, that’s why I easily adjust with everyone, and in my bad qualities, I am bit short tempered, Sir which I want to improve and working on it. I.O. : Ok, Prateek tell me about any instance where you’re this bad quality rose up? I.O. : Ok, Prateek now tell me about your hobbies and interests? Ch. No. 18: Sir, in my hobbies there are photography, reading, and feeding birds. And as my interests are considered there are visiting orphanages and watching F-1 races. I.O. : Ok, Prateek how do you feed birds and perform photography. Ch. No. 18: Sir, everyday I put on some water and rice top of my roof to feed the birds. And in photography, wherever there is in any function in my family I perform the role of photographer, and whenever I got to any tour I took photographs of natural scenes. And also when there is rainy season and clouds are there, I also take those pictures. I.O. : Ok, Prateek what about you’re reading? Ch. No. 18: Sir, I read newspaper The Times of India, read two magazines namely India today and Competition Success Review. I also read short stories of Sherlock Holmes and novels of Dr. A.P.J Abdul Kalam. I.O. : Ok, Prateek what about this hobby visiting orphanage, it’s really very-very strange. Ch. No. 18: sir, I have hobby of visiting orphanages as I want to help the kids who have no parents and also I want to help the country with its future. Sir, I visit Jyotini an orphanage twice a month. Sir, I take candies for them and teach them some lessons for some time. They also pay respectable attention to me. I.O. : Ok, Prateek but what about the rag pickers, who are there on roads, aim and they the future of the country? Ch. No. 18: Sir, they are the future. But as I am not having so much power to take these kids to my home from roads. I try to help them on roads only by providing them with food and meal instead of giving them money which is always contributed in the circle of this evil practice. I.O. : Good Prateek, ok do you know about the Paraguay why is it famous? Ch. No. 18: Sir, Paraguay is a country in South America and it is famous for Pampa’s grassland in South America (I was not sure why it was famous). I.O. : Ok, do you know about Article 370? Ch. No. 18: Yes sir, in this the law passed by Union Government are applicable to all states except J&K where it is applicable only when it passed by assembly of J&K. I.O. : Ok, tells me about naxalites? Ch. No. 18: Sir these are SC and ST people who criticize the government policies and demand for special rights for SC and ST. But the path adopted by them of violence is not correct. I.O. : Ok, thank you Prateek, and all the best for your conference? I.O. : Prateek, I thought that I was talking to a member of NGO. That’s good. Prateek is well prepared and has a capacity to take on the questions aimed at him at a fast track. The answer have been given confidently, clearly, logically to the best of his ability and approach. Prateek has been able to maintain a cheerful disposition during the interview process. He has been frank, understanding and tactful while answering difficult question. He has a sound knowledge about his subject and confident to answer the question put at a rapid speed. He has a good sense of humor and can maintain his cheer during interview. His general awareness is of high order and can take on any question related to current events and general profile in school. He is the appropriate student to be selected for the job. If you are going for your SSB interview for any of the commission i.e. 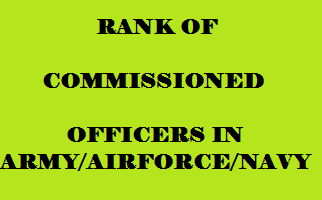 Army, Air Force(IAF), Navy, Indian Coast Guard(ICG) then you should be aware of various ranks in these commissions. I am uploading this article after hearing the SSB interview experience of my friend Ashish Rathi, who was asked for ranks of commissioned officers in Indian Army. 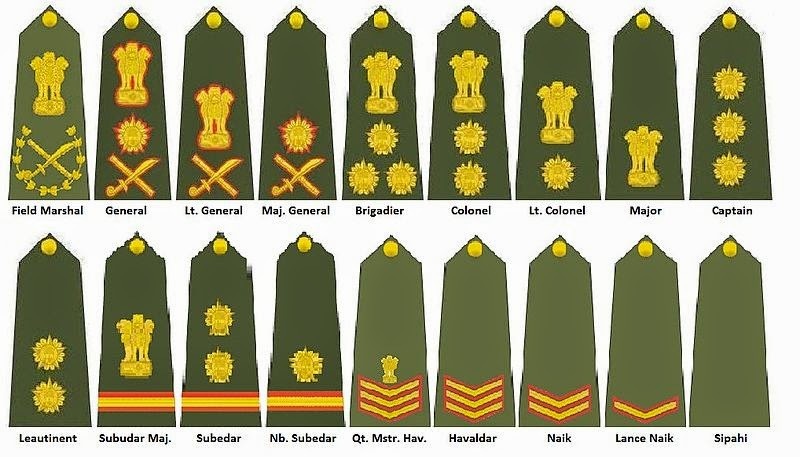 India has a field marshal rank, but it is mostly honorary. It does not currently exist in the army organizational structure; however, two officers were conferred with this rank, namely the late Field Marshal Manekshaw and the late Field Marshal Kodandera Madappa Cariappa. A field marshal, unlike other officers, does not draw a pension. He gets the full pay of a general equal to the Chief of the Army Staff until his death. He wears full uniform on all official occasions and runs an office in army headquarters. He also has a dedicated secretariat of his own. The officers in the Coast Guard have the same rank structure as the Central Armed Police Forces. The director general Coast Guard is usually a vice admiral rank officer on deputation from the Indian Navy. The group Testing Officer after finishing the indoor tasks leads the student towards resumption of Ground Task. The theoretical skills are at premium while dealing Group Discussion(GD) and Group Planning Exercise(GPE), whereas practical application starts at the onset of Group Task. Let us analyze the essentials of Ground Task. Virtually, the Armed Forces want a mix bag of students exhibiting intellectual, mental and physical skills to fit the slot in the officer cadre. To check the practical intellect, coupled with resourcefulness, the student is exposed to Ground Task Progressively in the learning as well as validating mode. To check the performance of students in different terrain configuration is a difficult issue, which is neither viable nor practical. To check the practical profile of the candidates, the task are designed in such a fashion that it can be tackled by each student. In Progressive Group Task, the first obstacle is simple to second, second is simple to third and virtually fourth obstacle is the most difficult to tackle. Two white lined are drawn predominantly 20 feet way approximately, and declare the area between these demarcations as electrified or out of bound. The structures are provided between these white lines which are required to be tackled by candidates with the help of helping material provided to negotiate the obstacles. These set of white lines are basically parallel lines, and they meet at identify the structure are made of wood/steel projection approximately four to six feet in height between the start line and finish line. To help the students to perform, helping materials is made available to students in form of planks, ballies, roped, etc. which can be utilized for going over the structures. A cumbersome load is also required to be carried along with the group over the obstacles in same fashion in which the students cross over the structures. The GTO describes the structures, helping material, load, etc. to the students and make them understand about the modalities of crossing over the obstacles and explains the rules and procedures to be implemented at the time of negotiation the obstacles. The structures are colored in distinct colors which has been done to facilitate the instructor to increase/decrease the degree of difficulty in performing over the obstacles. Like we see, that white signifies peace and it is the most common color used over the structures, which can be used for crossing by the group. Other pre-dominant color is red, which out of bound where used, or any portion of the structure depiction the red color should be declared out of bound to students. There is a common color blue/green/yellow, etc. which can be utilized by the students personally, without subjecting the load on top of the structure. Other common color which we see in the countryside is black, which is basically used to avoid the structure being eaten away by the ants and does not signify any relevance during conduct of the task. Distance, upto four feet or less can be jumped across, but distance beyond four feet is required to be bridged, it means, you have to shorten the remainder distance and make up the short fall of the distance by making extensions, etc. so that the ultimate distance is within the reach and easily get over the structures comfortably. Once the rule are clear, the GTO conduct the group over the set of four obstacles and gives elaborate briefing, monitors and maintains progressivity over the task.